Serves 6 to 10 people. This size usually fits over two standard burners. The pan is made of carbon steel (aka polished steel, or acero pulido), which is ideal for paella since it conducts heat quickly and evenly. The pan is thin but quite rigid and durable, with a hammered dimpled bottom. The handles are made of steel and painted red. Carbon steel is the traditional material for paella, and some paella devotees feel that it enhances flavor. 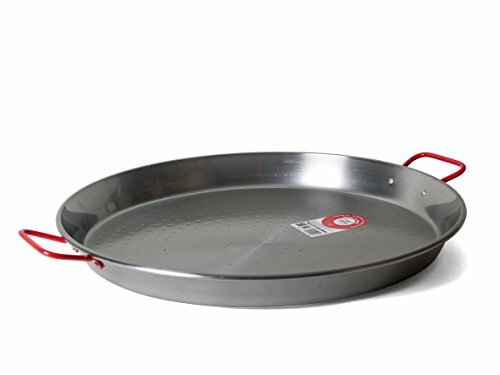 As with any raw steel pan, it requires some care: you must dry the pan right after washing it and then rub the inside with a little vegetable oil to prevent rusting. If the pan does rust, a few passes with steel wool takes it right off. Carbon steel is durable and conducts heat well. requires a bit of maintenance after washing. Ideal for serving 6 to 10 people.